WASHINGTON, March 19. /TASS/. Incumbent Russian president Vladimir Putin won a landslide victory in Sunday’s presidential election held at the Russian Embassy in Washington, D.C., the local election commission said. According to the commission’s final protocol, Putin clinched 1,531 votes. His closest competitor was TV personality and socialite Ksenia Sobchak, nominated by the Civil Initiative party, who was backed by 347 people. Director of the Lenin State Farm Pavel Grudinin, nominated by the Communist Party of Russia came third with 237 votes. Head of the Yabloko Party’s federal political committee Grigory Yavlinsky garnered 99 votes, followed by leader of the Liberal Democratic Party of Russia (LDPR) Vladimir Zhirinovsky with 45 votes. Chairman of the Party of Growth and Russian Presidential Envoy for Entrepreneurs’ Rights Boris Titov received 44 votes and head of the Russian People’s Union party Sergei Baburin won 21 votes. Just 8 Russians backed Maxim Suraikin, nominated by the Communists of Russia party. A total of 2,383 Russians took part in the voting held at a ballot station number 8273 in the Russian Embassy in the US. Out of them, 1,395 citizens cast their votes in the diplomatic mission on Sunday, and another 982 people cast ballots in the early voting. Another six citizens voted outside the voting premises. For conducting the voting in the United States on March 18, polling stations opened at four Russian diplomatic missions, including the Embassy in Washington, D.C., the consulates general in New York, Seattle and Houston. Early voting was conducted on March 5 in Denver, Colorado, on March 7 in Kansas City, Missouri, on March 10 in Orlando, Florida, and Sacramento, California. Apart from that, voting took place on March 11 in Atlanta, Georgia, Boston, Massachusetts, Dallas, Texas, Los Angeles, California, Miami, Florida, Minneapolis, Minnesota, Albany, New York, San Francisco and San Jose, California, Philadelphia, Pennsylvania, and Chicago, Illinois. 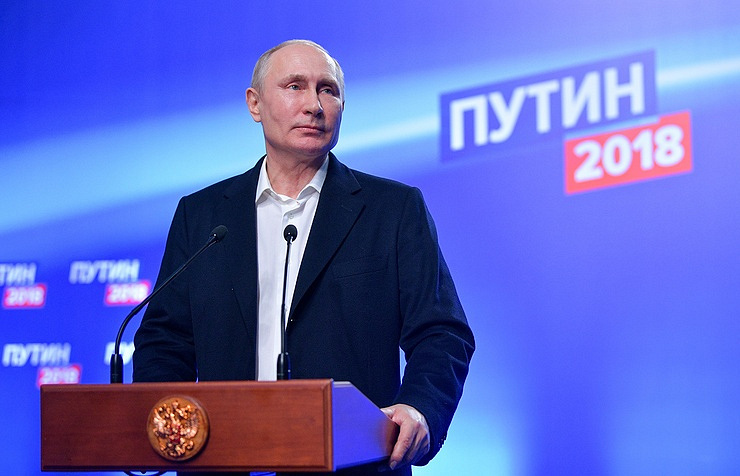 Russia’s incumbent head of state Vladimir Putin has garnered 76.65% of the vote in the March 18 election with 99% of the ballots counted, the Central Election Commission said. Director of the Lenin State Farm Pavel Grudinin, nominated by the Communist Party of Russia, is second with 11.82% of the vote, while leader of the Liberal Democratic Party of Russia (LDPR) Vladimir Zhirinovsky is third with 5.68%.